In her book What Happened, Clinton lists a plethora of reasons why she lost the 2016 presidential election. At no point in the book or during the promotional tour that followed, did she square blame for the loss on herself. In an interview with Esquire, Senator John McCain went off on Hillary Clinton’s embarrassing excuse tour. You’ve got to understand that you can’t rewrite history,’ McCain said in an interview published Monday. McCain had the Senate to fall back on when his presidential aspirations went belly-up. Hillary had only a series of sympathetic TV interviews and her book tour. McCain suggested she got back on the horse too quickly. 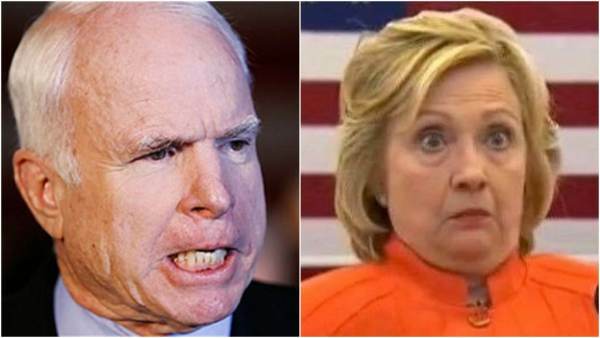 ‘This is Hillary’s problem right now: She doesn’t have anything to do,’ McCain said. If there is somebody who can emphasize with Clinton, it’s McCain. The Arizona lawmaker got his behind handed to him by Obama in 2008. Yet, even he’s not buying Clinton’s excuses. Once you’ve lost support from the anti-Trump RINOs, it’s time to pack it in, Hillary. “Even Trump hater John McCain is tired of Hillary’s whining about losing the election,” tweeted Paul Joseph Watson. “She made a connection between Mr. Obama and what she called her biggest gaffe of the campaign: telling voters in Ohio, we’re going to put a lot of coal miners and coal companies out of business,” writes Mark Landler in the New York Times.